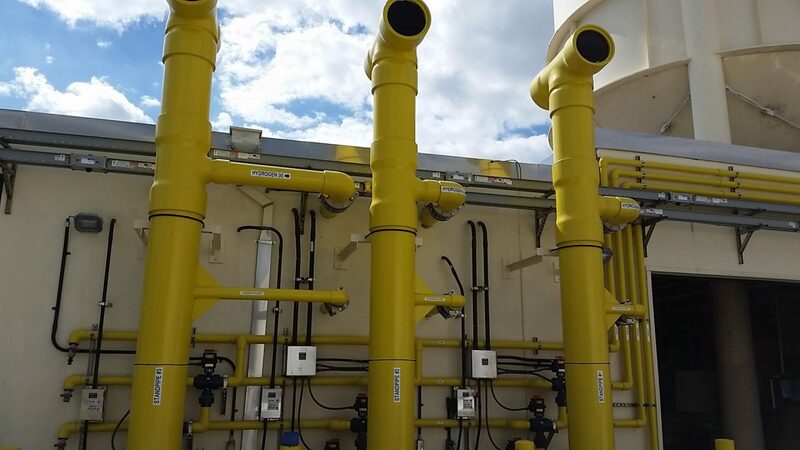 Glades Road Water Treatment Plant (WTP) / Wastewater Treatment Plant (WWTP) On-site Chlorine Generators (OSG) Rehabilitation | Wharton Smith, Inc. The City of Boca Raton has always been at the forefront of advanced drinking water and wastewater treatment. Over a decade ago, the City converted from a gas chlorine storage-and-feed water treatment system to a safer on-site sodium hypochlorite generation-and-feed system (OSHG) that serves both the Water Treatment Plant and Wastewater Treatment Plant. 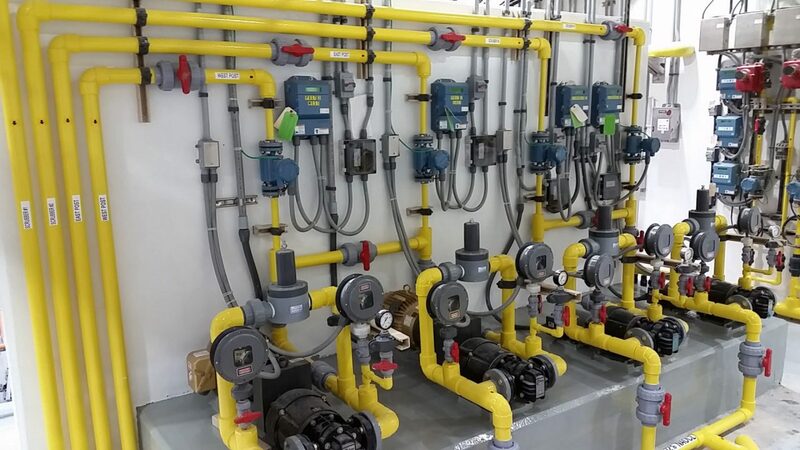 In 2013, Wharton-Smith was selected as the general contractor to replace the existing OSHG with three new 1,500 pounds per day generation units including installation of three individual stand pipes for hydrogen reduction. 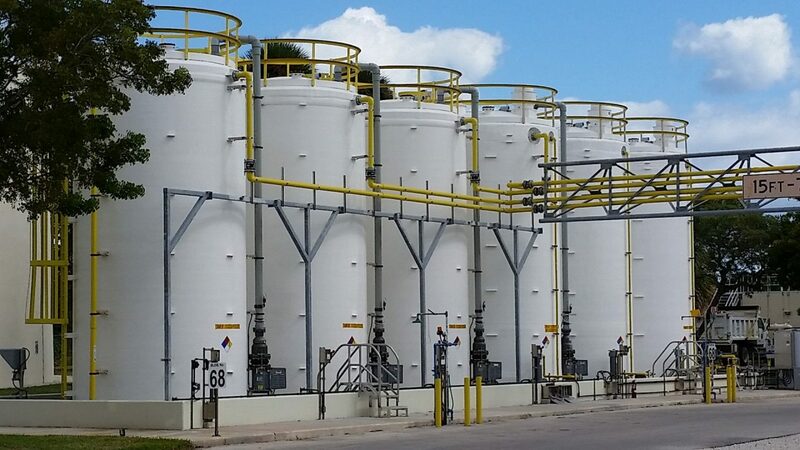 These units generate 0.8-percent sodium hypochlorite solution, which is transferred to the on-site storage tanks, where it is fed into the treatment process. The project also includes replacement of the two existing 70-ton brine tanks; replacement of the existing five FRP sodium hypochlorite storage tanks, all associated piping, valves and ventilation blowers; installation of an additional FRP 12% sodium hypochlorite storage tank and additional FRP chemical tank replacements; installation of centralized carbon filter/water softener system; installation of a semiautomatic/automatic 12% to 0/8% batch type dilution and product transfer pump system; construction of a climate controlled building to accommodate the OSHG system; demolition and replacement of the 12% sodium hypochlorite feed pumps and controls and associated piping. The project also included extensive site working including civil, mechanical, instrumentation, electrical, grading and paving.